If your web browsing experience is being interrupted by Fastncheap Ads, we are here to tell you that you have been infected by an adware application called FastnCheap. 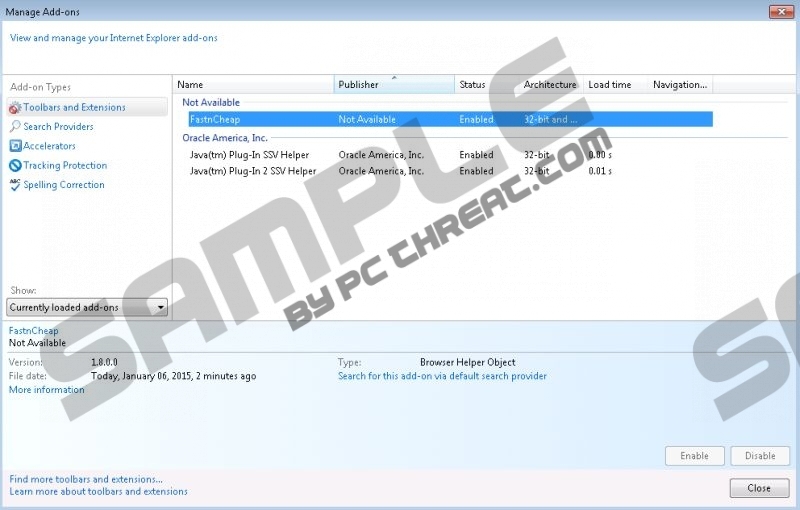 It was made using the JustPlugIt engine, so there are many similar adware applications, for example, RealDeal, TicTacCoupon, LuckyCoupon, SaveNShop, and others. It is best to remove any of them immediately. Fastncheap Ads start appearing when the adware application that supports them is added as a browser extension on Mozilla Firefox, Google Chrome, or Internet Explorer. This application tracks your web browsing to gain enough information to tailor Fastncheap Ads according to your perceived hobbies and needs. These commercial advertisements can annoy you so much that you will wish you knew how to remove them. They could also be dangerous in some cases, because the Fastncheap Ads developers claim that they are not responsible for the content and privacy policies of their third party partners. It is conceivable that your computer could be infected by more adware or even malware after clicking Fastncheap Ads. If you do not remove these ads from your system immediately, it could be quite difficult to delete all undesirable programs, which entered your system through the hole left by FastnCheap Ads. Like all examples from the JustPlugIt family, Fastncheap Ads are distributed using freeware bundling. Bundle installers are one of the most effective ways for developers to distribute barely, if-at-all, useful software. All you, as a computer user, have to do is choose to install it using Basic setup and click away until you see the Finish button. If you have ever done this before, chances are that several applications you did not intend to install were on your computer when done. To avoid getting free programs you do not want, like FastnCheap, you should always choose Custom installation and make sure to click off any checkboxes that offer to install applications you do not plan to use. Removing Fastncheap Ads from your system can be done in two ways. You can manually uninstall FastnCheap from your computer or download a powerful antispyware program to scan your hard disks and registry. It will find all dodgy programs and uninstall them with a click of your mouse. It will also offer live protection in the future. If you want to terminate FastnCheap Ads by hand, the instructions are below this article. Click Add or Remove Programs, select FastnCheap, and Remove it. Go to Start menu by clicking the Windows button. Go to Control Panel, click Uninstall a program, and Uninstall FastnCheap. Right-click the bottom-left corner of your Desktop and go to Control Panel. Right-click FastnCheap and click Uninstall. Enter chrome://extensions in your address bar and click Enter. Find FastnCheap and click the trash bin next to it. Enter about:addons in your address bar and click Enter. Go to Extensions and Remove FastnCheap. Quick & tested solution for Fastncheap Ads removal.